Remove the engine assembly. Refer to “engine assembly removal” in section 1d . Remove the crankshaft assembly. 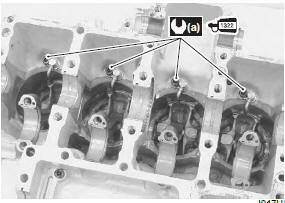 Refer to “engine bottom side disassembly” in section 1d (page 1d- 49). Remove the piston cooling oil jets (1) from the upper crankcase. use new o-rings to prevent oil pressure leakage. Remove the throttle body. Refer to “throttle body removal and installation” in section 1d (page 1d- 10). Remove the regulator/rectifier. Refer to “regulator / rectifier removal and installation” in section 1j . 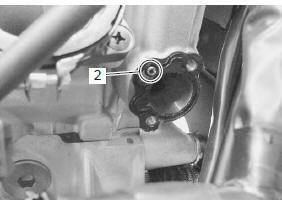 Remove the cam chain tension adjuster (1). Refer to “engine top side disassembly” in section 1d . Remove the oil jet (2) (for cam chain tension adjuster). Install the cam chain tension adjuster. Refer to “engine top side assembly” in section 1d (page 1d- 28). Install the regulator/rectifier. Refer to “regulator / rectifier removal and installation” in section 1j . Install the throttle body. Refer to “throttle body removal and installation” in section 1d (page 1d- 10). 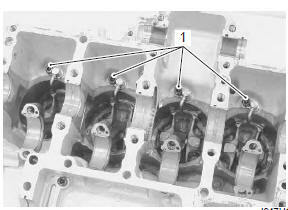 Separate the crankcases, upper and lower. Refer to “engine bottom side disassembly” in section 1d . Installation is in the reverse order of removal. Refer to “engine bottom side assembly” in section 1d .